In the late summer of 2014 my wife and I thought it was time to explore Central Oregon. Western Oregon gets most of the press. With ocean shores, lush forests, waterfalls, and fertile valleys, if you were to ask the average visitor to describe Oregon in one word they’d likely say “green.” But Oregon is almost like two states: the well-watered, more densely populated green state on the west side of the Cascade Mountains, and the sparser deserts to the east. As the Cascades run down the east edge of the western third, Central Oregon falls into the dry zone. Except when it rains paint, of course. Our day of departure started off with an inauspicious start. The wife woke up with an attack of vertigo, and for a time we thought we’d need to abort. 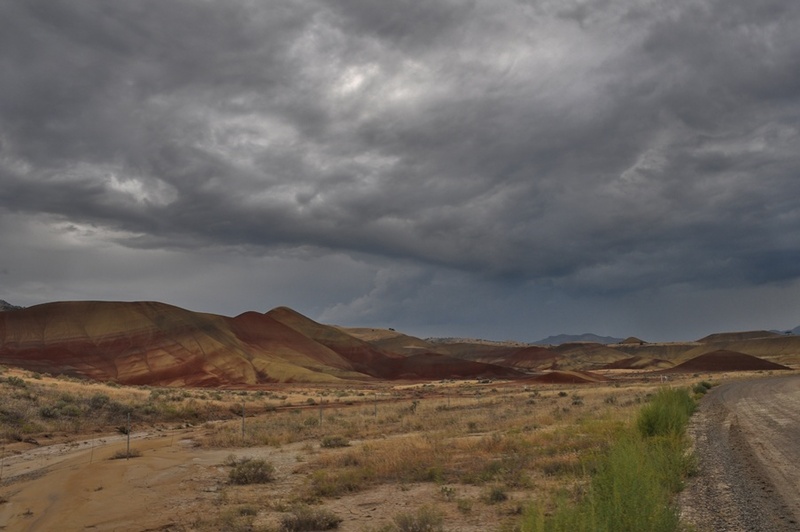 Fortunately, it eased up, and we were off to the Painted Hills. 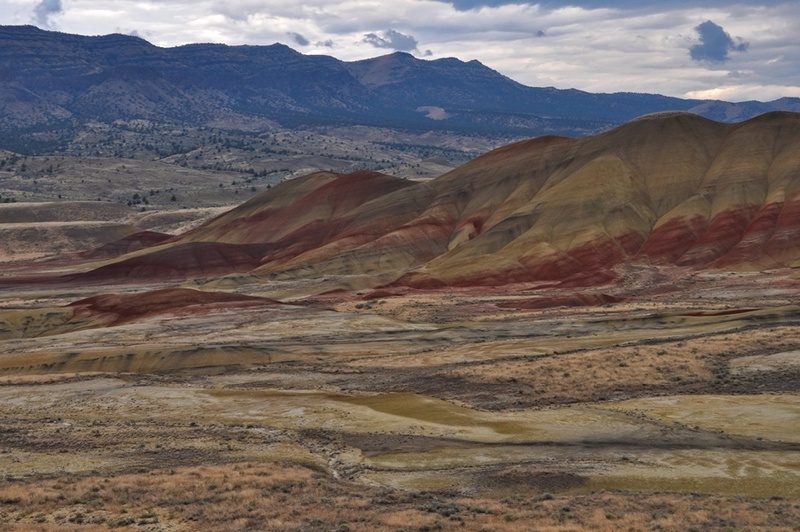 The Painted Hills are in north central Oregon, about 9 miles northwest of the little town of Mitchell. We arrived in the early evening, but hopes of seeing the hills at their best were dashed. Rather than the glowing light of a golden hour embracing the warm colors of the hills, the stormy greys of a cloud deck threatened to add more mud to the prior night’s storm residue. This wasn’t your usual mud either. Made from the silt of a very fine clay, if you were to walk in it, rather than simply getting a little dirt on your shoes you’d accumulate it in clumps, with the load growing on each sticky step. Although rain threatened and the light was waning, we did make it to the main viewpoint. Colors were subdued, but the spectacle remained. Sure, it wasn’t bathed in golden sunlight, but it left promise for the day to come. We spent the evening in Mitchell. Being such a small town, the only place I’d found to stay was the Oregon Hotel. Originally built in the late 1800’s and rebuilt in 1904 after a fire, it’s best described as more homey than fancy. But it was clean and relatively inexpensive, and did the job nicely. It also gave us the chance to meet a few fellow guests. 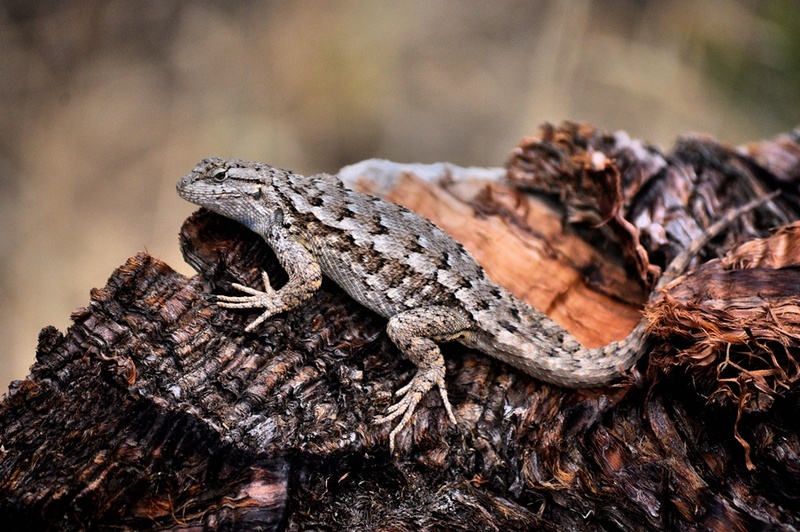 Nope, not this guy, we encountered him on the trail. But there was a couple older gents, folks who’d grown up in the region and came back periodically for reunions and to do a bit of fishing. They’d brought enough food for a regiment and invited pretty much everyone to join them for a steak dinner, cooked on a hot plate. We wanted to check out one of the restaurants in town, but after our return we did join them for a drink – seems one of them was a homebrewer. I can’t say for certain, but it’s possible that tasty brew was a factor when I bid on a homebrewing starter kit at a silent auction a couple months later, setting me on the path of yet another hobby. The threat of rain had dissipated somewhat the following day, so we returned to the hills and explored their trails. You may wonder by now, what caused all these strata of colors? 35 million years ago this area was a tropical floodplain. Covered with vegetation, decomposition, time and changing climates laid different layers, augmented with ash from the occasional volcanic eruption. These muddy layers also made for good fossil territory. About 35 miles east of Mitchell is the Thomas Condon Paleontology Center, where scientists actively study the region’s 50 million years of plant and animal evolution through a massive collection of 40,000 fossils. Thanks, Boots. It’s a pretty amazing place. 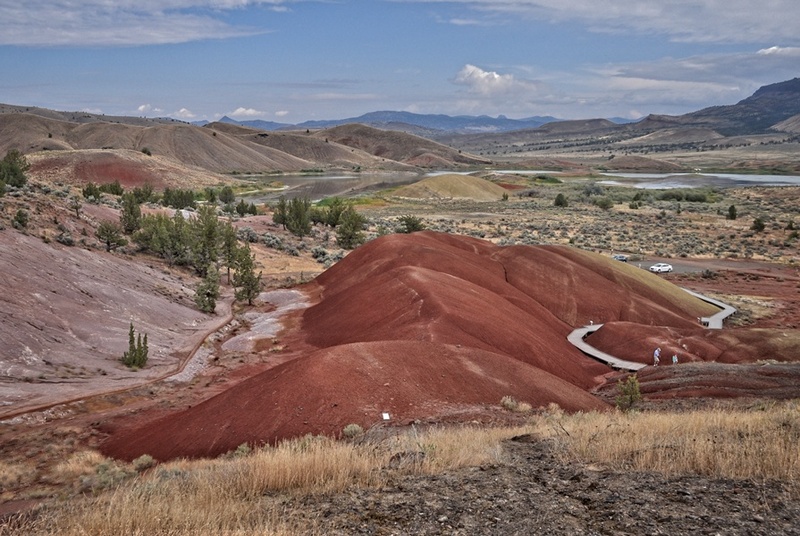 A fascinating set of photos of the bleeding hills of Central Oregon! My wife and I traveled through this fascinating landscape in 2011. Keep on Plying, my friend! Strange and beautiful. I know there’s something similar and even more striking in China, but I wonder why it’s not more common? 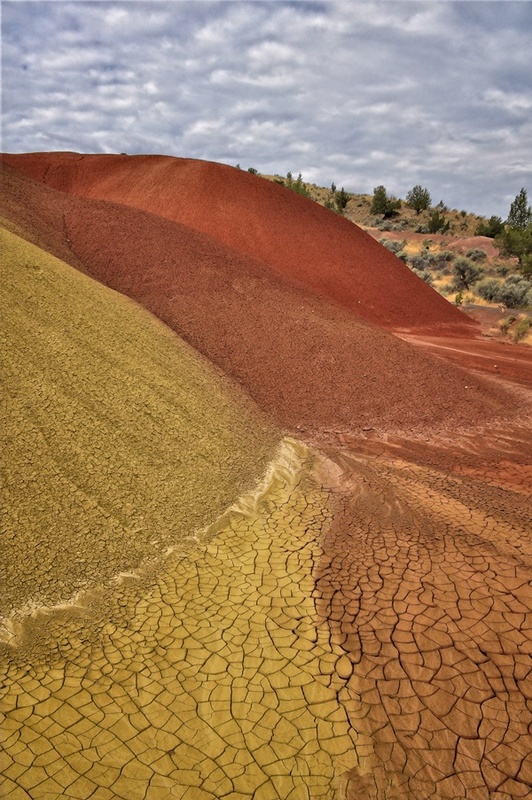 This is great, I never heard of these Painted Hills before, it really does look like a massive paintbox – – the last shot really reminded me of Art Day in primary school, only neater. It’s a pretty neat planet we’ve got, always up to something, maybe a bit temperamental — hard to believe this was a tropical floodplain. Hard to believe ocean fossils in the Rockies too, but they’re there. It’s an amazing planet, and sometimes folks forget how old it is and that we’re likely just a relatively short, passing phase. Beautiful photos! I hope I get to go there someday. I hope you can too. There’s a lot of amazing countryside out there, and you don’t even have to jump on a plane to get there. Very cool, especially the last one. Really vibrant colors, more than I’d expect. It is kind of amazing the range of colors in such a small area. 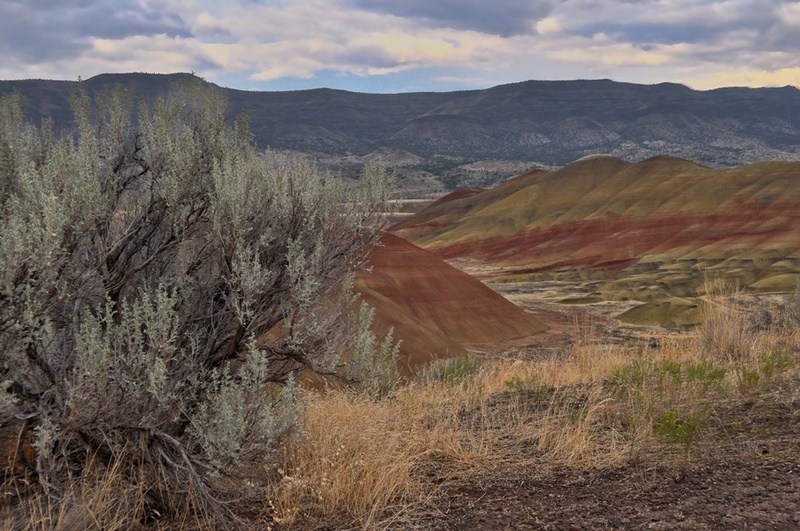 I loved our trip to the Painted Hills last November. They’re one of the more stunning attractions east of the Cascades, that’s for sure. We did not stay in Mitchell but opted to continue on to Pendleton instead. Sounds like we missed out on some interesting local flavor! Yes, it was. And I agree! Good thing we started this so early. So true that most never hear of Oregon’s desolate regions. I’d rather explore this area than the coast. I also like the stormy skies. True it dulls the colors, but it adds to the sinister beauty of the landscape. I don’t get many dramatic stormy sky pictures. Around here the rains are usually accompanied by flat grey skies – no texture or lightning. I don’t know that I’d rather explore the desert side, but I really do need to explore more of it. This post made me feel homesick for the red earth when the first rains come after a long dry spell in Africa. Something that remains as one of my favorite experiences and definitely my favorite smell. Your photos are glorious. They give the feeling of being submerged into a huge earth toned painters palette. What a glorious place to visit. There’s nothing quite like the smell of rain after a long dry spell. So cleansing. “Earth toned painters palette” – that really sums it up. Pretty remarkable, Dave. Under bright sunshine they must certainly look impressive! From what I understand they have a different look under different lighting conditions, rain can darken the colors, and in winter snow can add yet another dimension. Eye opening shots, Dave. 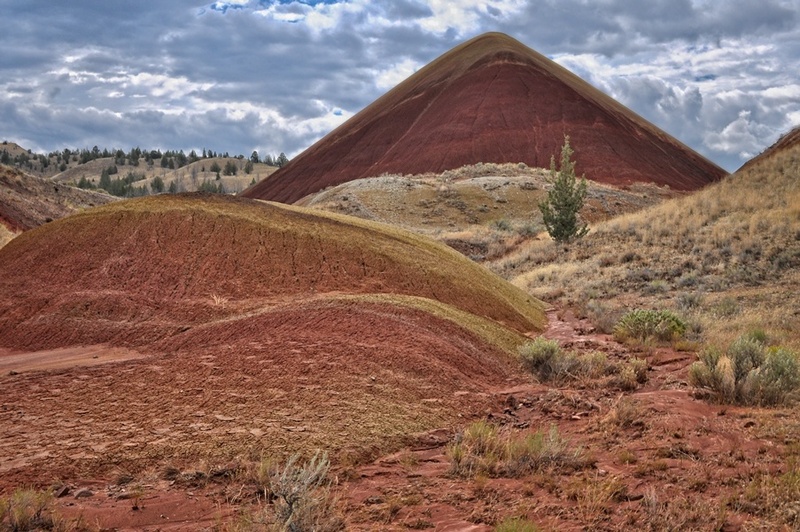 Have you seen the Painted Desert, Arizona? I don’t think I’ve seen the Painted Desert, although it’s possible I passed nearby back in ’77 on the way to the Grand Canyon. The southwest does have some interesting geology. Some of your shots resemble mine from a trip with my son, November 2003. That last photo beautifully illustrated the point. That it did. While the overall countryside suggested a palette that last shot inspired the first paragraph. There is a bit of green here and there. There’s also ranching in the area, and some irrigation. Painted Hills beef is generally considered to be of high quality. So beautiful. I love your opening shot. It’s cinematic! Dramatic skies and a unique landscape – what more could we ask for? Had to look up plein air painting, amazing how much changing one little letter in a word will do. You could probably still do it, but you’d need to pay attention to your nearby surroundings as well as the subject. Absolutely beautiful photos with subdue colours and the dramatic sky. Thanks, Otto. 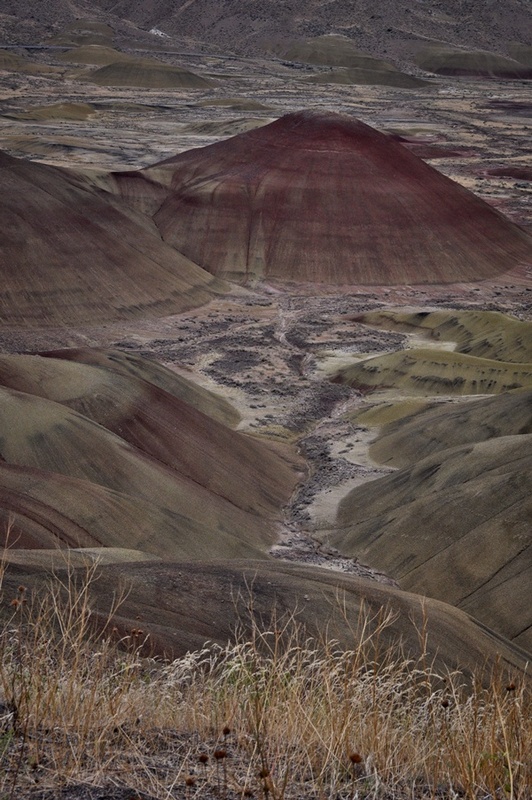 So many of the pictures I’ve seen of the Painted Hills have the saturation cranked up way beyond reality, I tried to keep that temptation in check. That is beautiful, although not at all what I usually think of when I think of Oregon. Thanks for sharing! Yep, even though there’s more dry side than green side in Oregon, it’s the green side that gets the attention. Two completely different kinds of beauty. I’ve never seen such a thing, Dave. Great photos of this very cool landscape! Glad to expand your horizons, Lex. Yet another cool place to visit. I enjoyed this, Dave. Your writing just flows along…. We went to explore central OR last year, in May, and stayed at an airbnb outside Mitchell. I love your story about the men and their reunion – easy to picture, having been through the area. We loved the small towns in that area. Everyone was preparing for the eclipse onslaught – that was a little scary, imagining thousands of people in those tiny towns. Apparently it all went well though. 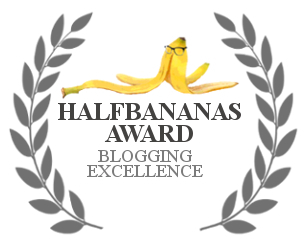 We didn’t have rain – that was bad luck! – but it was overcast. 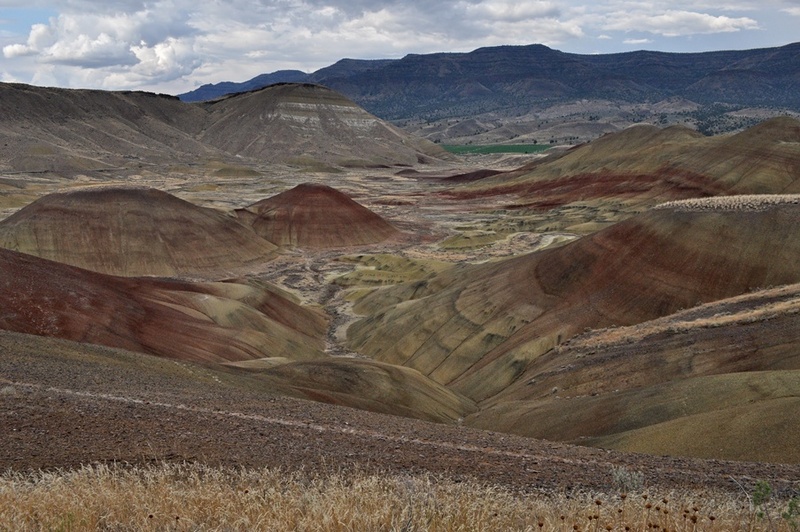 Still, the Painted Hills were amazing. Your final photo is fantastic! Have you ever been to the Kam Wah Chung Heritage Site in John Day over in John Day? We were floored by that place. Thanks, Lynn. I just started looking into AirBnB last year, I suspect it’ll be a regular option going forward. I imagine the hoards descending on those towns would both a sight to see and avoid. I haven’t been to the Kam Wah Chung site, but saw a feature on it on our local PBS station a while back. I haven’t actually been in John Day since I passed through moving out here in ’77 – guess I’m due. I guess it would be more than a day trip. 🙂 If you try airbnb, stick with 5 star only, because everyone is overly generous with their ratings. Read reviews carefully to tease out what you want and don’t want. I think I’ve stayed in airbnb’s over 20 times, and only one or two were less than satisfactory, and many were great. That’s one thing about doing a post on these sort of sites, folks suggest similar amazing ones: Artist’s Palette, Painted Desert in AZ, etc. Guess we’ll have to do something like your van trips. Is your rig prebuilt campervan style, or did you customize? It’s incredible how a ‘freak accident’, at least geologically speaking, created such a wonderful colour palette. Fantastic post, Dave. Really a pleasure to see Central Oregon in all its glory, I had no idea they had this stratified landscape, the Painted Hills. Your photos were really lovely, capturing the many colors in the land and sky. I chuckled at hearing about the inspiration that prompted you to start the home brew hobby. Thank you. I would love to see this landscape and will keep it in mind next time I’m heading north. Thanks, Jet. It’s always nice to discover a new interesting place, especially if it’s in driving range. The homebrew thing was something I’d dabbled with at U-Brews in past years, but the reminder of homebrewed beer quality followed by the serendipity of a beer kit at a fundraiser gave me that last little push. Beautiful description of the other half of Oregon ~ the one I grew up in, dry high-desert country of Eastern Oregon. Loved the opening paragraph and description of the scenes, which you then photograph so well throughout this post. Great writing and photos to begin this morning, thank you and enjoy the weekend. I imagine growing up on the dry side would tend to give a whole different perspective on Oregon, and what constitutes beauty. I’m happy to get your day off to a good start, hope it finishes well too. The geology lesson was fascinating. I hadn’t realized Oregon had such landscape. 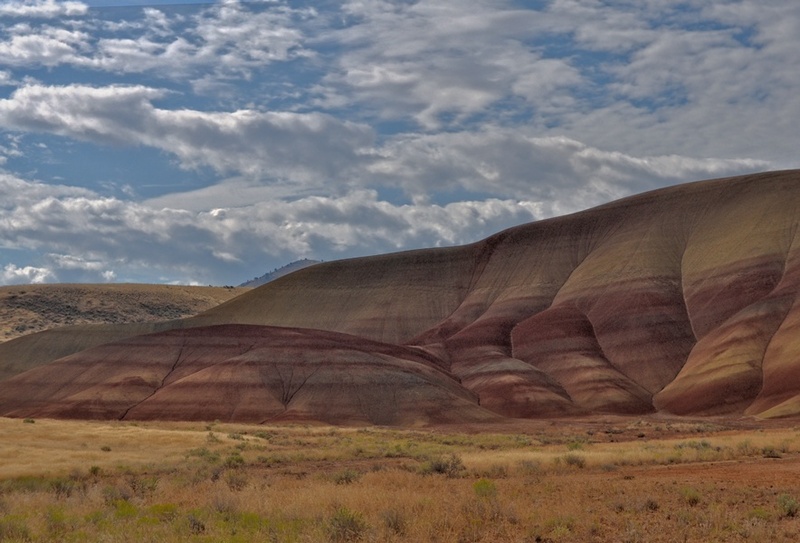 The place reminds me of the Painted Desert region of Arizona. Despite the gloomy conditions you have managed to bring out the colors in all their nuance. There’s probably more desert country than green country in Oregon. 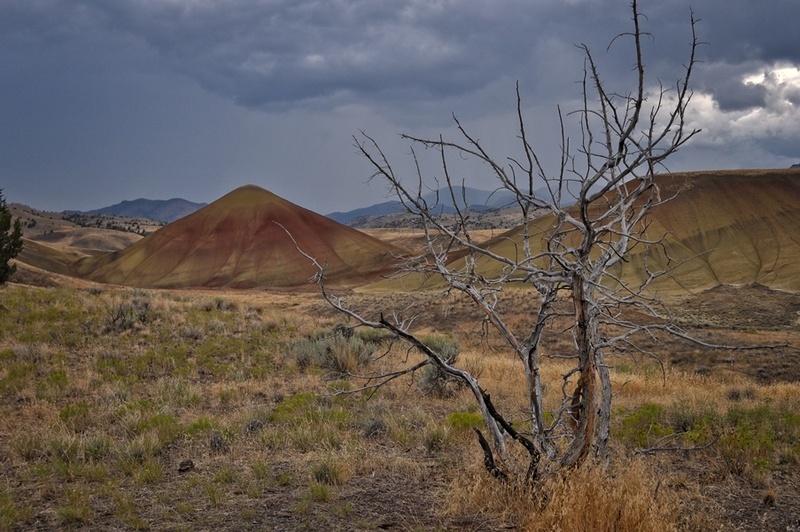 I’ve barely explored central and eastern Oregon, and much of what I’ve seen was years ago. It’s not all like the Painted Hills of course, there are other geologies and ecosystems as well. Guess I need to explore some more. Absolutely stunning! So happy you posted this because I thought of Oregon as all green too. This is amazing. I love how painted it looks. Well, it’s not all painted, but there is a lot of desert, more mountains, and on the border with Idaho a canyon as deep as the Grand Canyon. There’s much of the state I haven’t seen, especially in the southeast. I’ve seen pictures of the Chinese version, and if anything they look even more spectacular. I doubt I’ll ever make it there.